At Butterfingers we also offer an outside catering service. Whether it be a business event, party, wedding, christening, funeral, private dining or barbecue, we can help! We are a friendly, family run business, passionate about catering. How we can help with your outside catering needs! Organising any event can be stressful, so let us take care of the catering! We are dedicated to making your event a success and providing excellent food and service, at a price you can afford. Event catering is something we enjoy and we pride ourselves on our fantastic outside catering menu options. We offer finger and fork buffets, hot buffets, lunch platters, homemade canapes, afternoon teas and picnics. We tailor the menu to your specific requirements. Our outside catering business only uses quality ingredients and is all freshly prepared from our sandwich bar and cafe in Poole. Corporate Catering – whether it be for a small business meeting or a large corporate event, we can help. Offering delicious food and a professional service, let us take this job off your hands. We can deliver to your office or a venue of your choice. Event & Party Catering - birthdays, christenings, children’s parties, anniversaries, funerals and anything else you can think of! We can work on any event theme and dietary requirement. 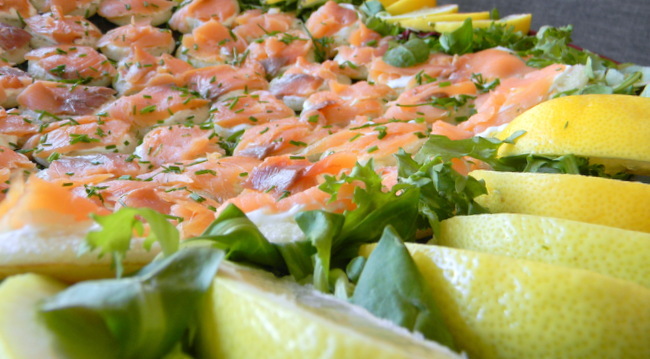 Wedding Catering – our outside catering service can cater for small weddings within Dorset. Please contact us to discuss your requirements or to see some sample wedding packages. Happy customers of our event catering service! As outside caterers based from our sandwich and coffee bar in Poole town centre, we cover the whole of East Dorset (including Bournemouth, Poole, Wimborne, Ferndown and all surrounding areas).